Item is a photograph of the Sherbrooke Railway and Power Co. power house on the Magog River. Item is a photograph of the Sherbrooke Railway and Power Company's water power before development. Item is a photograph of a postcard of the dam on the Lake Magog falls. Item is a photograph taken in 1890 with a view of the Magog river in Sherbrooke, industry along its banks, and a dam across it. Item is a photograph taken in 1876 with a view of the Magog river in Sherbrooke, a dam crossing it, and industrial buildings on the visible bank. Item is a photograph taken in 1905 with a view of the Ever-Rest Spring Bed Company factory on the banks of the Magog river in Sherbrooke. A dam is also visible. Item is a photograph taken in 1903 of industry along the Magog river in Sherbrooke. Buildings of the Ever-Rest Spring Bed Company are visible on the right bank and a dam crosses the river. The item is a photograph taken in 1900 depicting industry along the Magog river in Sherbrooke. Seen in the foreground is the Eastern Townships Corset Company, and in the background the Burton Brewery Company. A dam on the river is also visible. The item is a photograph depicting industry along the Magog river in 1900. 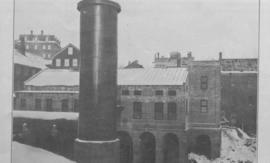 Seen in the foreground is the Eastern Townships Corset Company, and in the background the Burton Brewery Company. A dam on the river is also visible. 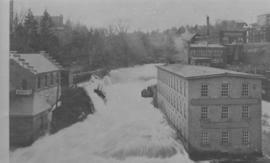 Item is a photograph taken in 1896 with a view of the Magog river in Sherbrooke, as well as a dam across it and industrial buildings along its banks, including that of the Royal Corset Company. Item is a photograph taken in 1891 of a river (presumably the Magog river in Sherbrooke) during winter. A dam is visible as well as industrial buildings on the bank. Item is a photograph, probably taken May 1, 1876, with a view of a river (presumably the Magog river in Sherbrooke) with snow still on the ground. Industrial buildings and part of a dam are also visible. Item is a photograph taken in 1878 of the Magog river in Sherbrooke with a view of a dam and a bridge crossing the river, and industrial buildings on its banks. Item is a photograph taken in 1875 with a view of the Magog River in Sherbrooke, a dam across the river, a bridge over it, and industrial buildings on its banks. La pièce est une photographie d’une groupe de mineurs à Eustis vers 1900. La pièce est une photographie de Virginie Dion Boudrias, le barrage à l’arrière-plan, à Waterville vers les années 1930. La pièce est une photographie du barrage à l’arrière de la meunerie de Théodule Dion à Waterville vers les années 1960. Item is a photograph of a group of log drivers on the North River (presently Rivière Eaton Nord) located in Sawyerville, the photograph is not the greatest of quality. Item is a photograph of the drive at the Sawyerville Dam, some people can be seen staring at the log accumulation. Item is a photograph of a logging crew of twelve men standing on a pile of large logs, possibly in the area of Marsboro. Item is a photograph of a log drive crew in Woburn.